Mark was mending the shirt with neat stitches. The stitches had ripped along the hem of the skirt. The couple removed every stitch of clothing before diving into the water. That new employee hasn't done a stitch since he got here. Running for the bus left Imogen with a stitch. The tailor stitched the seam. 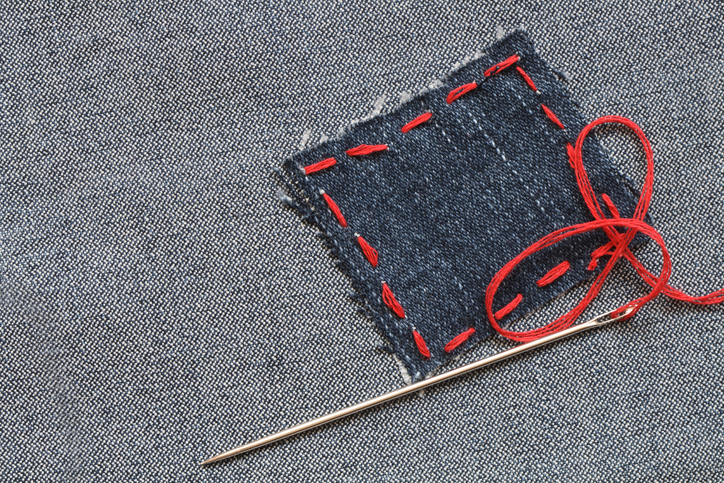 As well as being what is used to fix pieces of fabric together to make clothing, stitch is also the verb used for sewing together the edges of a wound to help it heal and the noun used for a single movement of a surgical needle or the loop of thread it leaves in the skin. A more formal word for a medical stitch is suture. Stitch dates back to before the year 900. The Old English noun stice (pronounced “stiche”), and later the Middle English verb stiche, originally meant ‘a thrust’ or ‘a stab.’ It can be traced back to the Proto-Germanic stikiz and the Proto-Indo-European compound stig-i-, from the root steig-, which could mean ‘to stick’ or ‘pointed.’ It is related to the Old Frisian steke, the Old High German stih and the German Stich, all meaning ‘a pricking’ or ‘a prick, sting or stab,’ as well as the Old Saxon stekan, the Old Frisian steka, the Dutch stecken, the Old High German stehhan and the German stechen (all verbs meaning ‘to stab or prick’); the Old Norse stik, the Middle Dutch stecke and stec, the Old High German stehho and the German Stecken (all nouns meaning ‘stick or staff); and of course the English verb and noun stick. The sense ‘a sudden stabbing pain in the side’ has been used since Old English, and was originally a figurative use of the main meaning. The senses related to sewing (and shoemaking) date back to the late 13th century, and have since then overtaken the original meaning. The figurative sense ‘a bit of clothing’ first appeared around the year 1500, while the colloquial sense ‘a bit of work’ dates back to the late 16th century. The surgical sense has been around since the 16th century. The expression “in stitches,” meaning laughing very hard, is a figurative play on making someone laugh so hard they get a stitch in their side. The verb comes from the noun, and dates back to around the year 1200, which coincides with the appearance and later prevalence of the sewing-related meanings.